The 48-year-old singer, real name David Emmanuel, died at his home in Warlingham, Surrey, in March 2011 while his house was being raided by Metropolitan Police officers. The reggae icon’s death provoked outrage at the time as yet another black man died under mysterious circumstances in police custody, and this verdict will do nothing to calm fears about racism and cover ups within the Met. The jury foreman delivered the verdict at the coroner’s inquest that: "David Victor Emmanuel took his own life. "Although the tragic events... were unforeseeable, giving one officer the responsibility of supervising Mr Emmanuel and, at the same time the premises search book, was a contributory factor in his death." The jury, which reached a majority but not a unanimous verdict on Mr Emmanuel's death, said he had "obtained a knife from an unknown location". 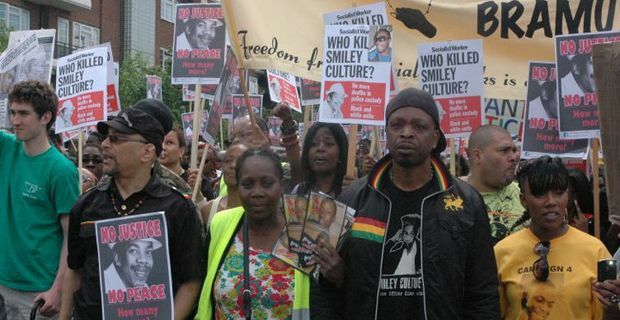 Many in the black community will no doubt find it difficult to believe that Smiley Culture committed suicide in this manner and will remain highly suspicious of the police version of events. And even if one takes that version of events at face value, stern questions have to be asked about how he ever had access to a knife in ‘an unknown location’. He was apparently being monitored by one officer who was unable to prevent his death. It seems odd, not least because the first instinct of police in any such operation is to secure the suspect so they can’t injure officers let alone themselves. "Four experienced officers felt it appropriate to detain a suspect in the kitchen, potentially the most dangerous room in the house, and afforded him a level of freedom not normally associated with an operation of this kind. Mr Emmanuel's cousin, Merlin Emmanuel, said after the verdict: "We have lost an integral part of our family. "He had a lot of hope and he had a lot to live for. "Why he should have wanted to end his life in that way I do not know, but I do not think he should have been in a position to do that."